Palestinian President Mahmoud Abbas met in Ankara Tuesday with 11 Palestinians who were released by Israel as part of the agreement that secured the release of Gilad Shalit from Hamas captivity. Fatah Central Committee member Jibril Rajoub also attended the meeting. Among the prisoners Abbas met during his visit to Turkey was Amna Muna, who lured teenager Ofir Rahum to his death in 2001. According to photos aired by Palestinian television, Abbas met with Muna privately. She was eventually deported to Turkey along with several other Palestinian prisoners. An official in Prime Minister Benjamin Netanyahu's office said it was "shocking to see a man who tells the entire world he wants to make peace with Israel fly all the way to Turkey to meet a despicable murderer." The Palestinian president also met with Jihad Ya'amur, who took part in the kidnapping and murder of Nachshon Wachsman in 1994. During the meeting Abbas said the release of the remaining Palestinian prisoners was at the top of the Palestinian leadership's agenda. Responding to the meeting, Ofir Rahum's father, Shalom, said "it enrages me, but I have no expectations of Abu Mazen (Mahmoud Abbas). I didn’t think for a moment that after she's released he will treat her like a terrorist – he always regarded her as a freedom fighter," Rahum told Ynet. "In one of her interviews, she described how she murdered my son Ofir. Now she's roaming freely in Turkey and has become a Palestinian hero…I've warned of this, but we haven’t seen anything yet. The consequences will come later," he said. Rahum noted that he is not disappointed by the Palestinians, but rather from "the State of Israel that let this happen." 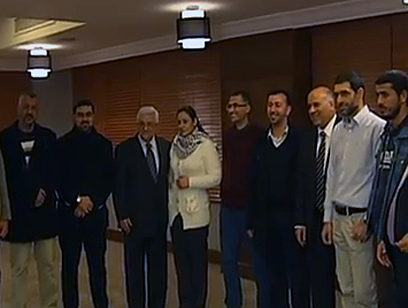 See all talkbacks "Abbas meets freed Palestinian prisoners in Ankara"